In more than 60 years of operation, Kemppi pioneered the development of both welding technology and productive welding solutions. The company also invests in continuous research and product development, placing the primary emphasis on usability and design, in addition to the products’ technical quality. The arc welding in the production of power industry equipment is a key process to manufacture safe and reliable structures. Constant welding quality provides a trouble-free lifetime of the products’ metal structures. Our contribution to this area is a wide range of advanced products from pulsed and modified metal inert gas (MIG) / metal active gas (MAG) welding to sophisticated tungsten inert gas (TIG) welding, as well as to welding production planning and quality management. Diversified welding needs can be managed by combining the options available for Kemppi’s offering (wise, match or welding management systems) to select the best welding solution according to the application. They provide an easily and applicable way to succeed in challenges that welders and management regularly meet. The FastMig range is suitable for the MIG/MAG welding of all materials in the heavy and medium-heavy metal industry and thin sheet applications. The range is modular, allowing the construction of different welding configurations by varying power sources, wire feed and panel options. FastMig is a MIG / MAG welding system that puts you in control, setting new standards for customer choice. The software architecture allows standard or tailored packages to suit your specific welding environment. FastMig equipment either include suitable Wise arc processes or they can be completed later. Wise products either influence the efficiency of welding performance, or provide a completely new welding process technique. Wise products enable new levels of performance that otherwise would be impossible to achieve with the standard MIG/ MAG welding process, in applications ranging from thin sheets to heavy structures. They also minimise the production costs and make the welding techniques easier. Kemppi’s MagTrac F 61 is a magnetic carriage unit for MIG/MAG welding mechanisation. Operating MagTrac F 61 is similar to operating any ordinary welding machine, so there is no need for special expertise. With MagTrac F 61, you do not need auxiliary control cables or transformers, everything is fully integrated in one cable. 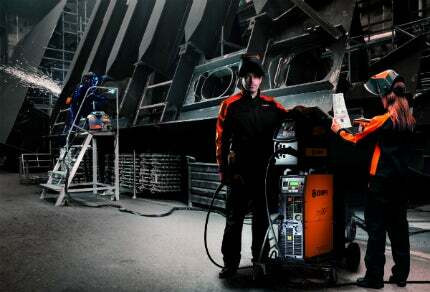 Kemppi’s SuperSnake GT02S MIG/MAG subfeeders can offer up to 30m more reach to MIG/MAG welding. It connects with standard Euro MIG welding guns, including the Kemppi WeldSnake range, increasing gun reach by up to 30m from the wire feed cabinet. The Kemppi Arc System 2.0 module ArcQuality links together the two most important elements of welding production: quality and productivity. With the ArcQuality service, it is easy to make sure that the entire welding process is carried out in accordance with the welding procedure specifications. At the same time, monitoring ensures that the welders are qualified to perform the tasks they are assigned. Possible deviations are reported automatically and in real-time. The system can also be used in preparation for maintenance operations, and the smart reader, the core of the system, compiles quality data for even weld-specific traceability. ArcQuality suits for all the producers that work according to the ISO3834, NORSOK, ASME and EN 1090 manufacturing standards. Kemppi is one of the world’s leading manufacturers of industrial arc welding equipment and a provider of solutions for highly productive welding. 90% of our annual revenue comes from international markets, with production plants in Lahti, Asikkala, Finland, and in Chennai, India. This thesis is part of the Arctic Materials Technologies Development project. A short preview of Kemppi's FastMigX for welding solutions. Kemppi has introduced many new innovations to the market, pioneering the development of both welding devices and productive welding solutions and services.